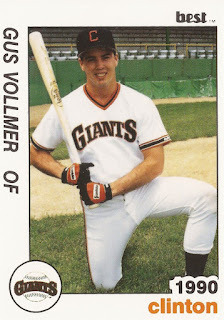 Gus Vollmer had success against Salt Lake in 1989, picking up 15 hits against the team by July 19, The Deseret News wrote. Four of those hits came in one game, a 9-2 win by Vollmer's Pocatello Giants team, The News wrote. "I've been trying to be aggressive at the plate," Vollmer explained to The News. Vollmer was in his first professional season that year. He ended up only getting into one more. Vollmer's brief career began in 1989, taken by the Giants in the 37th round of the draft out of the University of South Florida. At South Florida, Vollmer was set to platoon at first base in 1989. He had two RBI in an April 1989 win. With the Giants, Vollmer started at rookie Pocatello. In 27 games, he hit .351. He hit two home runs and knocked in 17. He moved to single-A Clinton for 1990. His average dropped to .230 with Clinton. He got into 67 games, hit three home runs and knocked in 23. It was his final season as a pro.